Choosing the correct size woodscrews for the job is more important than you may think. 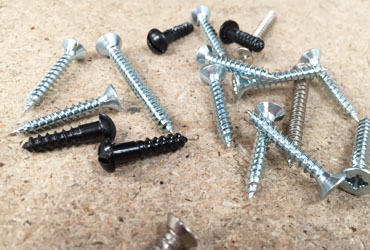 The wrong size screws can lead to shocking results in any DIY projects, causing splits in the wood, wobbly constructions or even brackets and fixings that fall out before the job is finished. This short article is to introduce you to several standard gauge woodscrews that are used in many DIY projects around the home, you'll also find a conversion chart showing imperial and metric dimensions for each gauge of screw. The following is a list of typical DIY jobs for standard-gauge woodscrews. #4 Gauge woodscrews are suited to very small cabinet door hinges, keyhole cover plates or escutcheons as they are also know. #6 Gauge woodscrews are ideal for light fixings including curtain rail brackets, door handles and lock sets. #8 Gauge woodscrews are perfect for internal door hinges, light-duty shelving brackets and general box construction. #10 Gauge woodscrews are for heavier shelving brackets, wall-cupboard and cabinet mounting also hinges on heavy duty doors including front doors. #12 Gauge woodscrews can be used for heavy duty shelving systems, small to medium central heating radiators, wall mounted boilers and outdoor trellis supports along with other similar jobs. #14 Gauge woodscrews are for heavy duty use including double-size central-heating radiator, shelving brackets that will be supporting heavy loads and sturdy frame construction like outdoor benches and tables. Now you know more about woodscrews and the typical uses for each size, you may also like to read how to choose the correct size door latch.